Who would’ve thought the “Queen of Idol Dramas,” Taiwanese star Joe Chen (陳喬恩), would be a Peppa Pig fan? 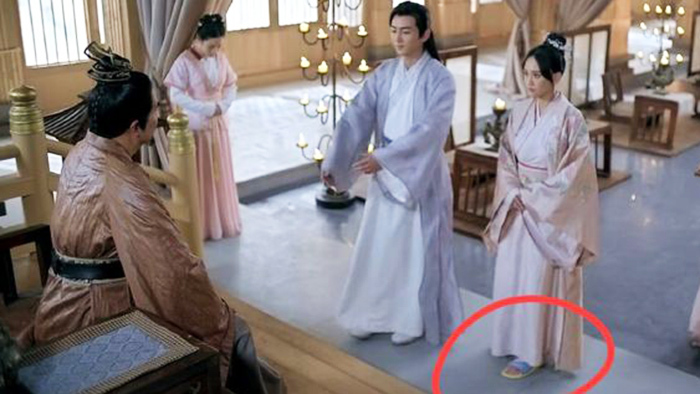 Sharp-eyed netizens recently caught the 39-year-old actress wearing Peppa Pig slippers underneath her dress in the Chinese period drama, Queen Dugu <独孤皇后>. Of course, viewers had to take screenshots of Joe’s plastic shoes peeping out and share the trendsetting look onto social media. This hilarious blunder happened during the ninth episode of the drama, which also stars Mainland actor Chen Xiao (陈晓), who plays Emperor Wen, Joe’s husband. With Chen Xiao and Joe acting as Dugu Qieluo in the show, were standing in front of the emperor to give their greetings when Joe’s shoes were accidentally exposed. Despite Queen Dugu taking over one year to post-produce, careless mistakes are inevitable. However, in a supposedly female-oriented political drama, the silly incident may not sit well with viewers, especially since the drama has received its fair share of criticisms. Some say the props and set pieces are unrealistic and very low budget, while others are not fans of the old-fashioned and clichéd script, especially of the cliff deaths. Netizens preferred the last adaptation about the Dugu sisters, The Legend of Dugu <独孤天下> more. Luckily, Queen Dugu is not a total loss. There are some netizens who are invested in the show, and the ratings are proof of that. Not to mention, Joe and Chen Xiao’s sweet love story swooned many viewers. The props are usually cheap and fake compared to the millions the artistes are paid. Dirty costumes recycled by extras etr. I have been to get wedding pictures shot before. The experience is horrendous because locations dirty and costumes are old, torn and tacky but all they care about is the result visually which can also be computer enhanced. production values have changed for the better with recent salary caps for big stars.